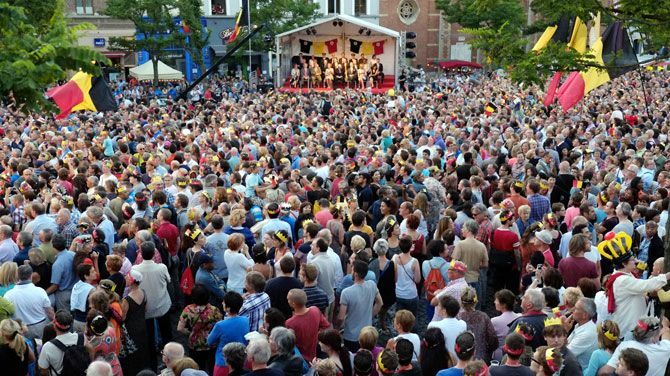 Place Jeu de Balles (Vossenplein) in the popular Marolles District of Brussels was the scene of a packed out People’s Ball on Saturday 21 July. King Philippe, Queen Mathilde and retiring Belgian King Albert and Queen Paola were surprise guests. It was the first time in the Ball’s history that any royal had attended. The square was packed by at 9:30pm the police had to stop people from accessing the area. Singers at the event included Johan Verminnen and Eurovision song contest winner Sandra Kim who sang the song ‘I love you’ to the king and queen. Former King Albert and Queen Paola clearly enjoyed the event, swaying to the rhythm of the music, while Queen Mathilde even joined in the singing. The Bal National was first staged ten years ago to mark King Albert’s first decade on the throne. The senior and young royals were joined by Deputy Premier Didier Reynders and the Mayor of the City of Brussels Freddy Thielemans. Inhabitants of the Marollen District had also made a special video in which they said their farewells to King Albert.